Do you know the important differences between dementia and Alzheimer’s? Many people don’t. And the two terms often cause confusion among patients and families, as well as caregivers. The terms Dementia and Alzheimer’s Disease are often used interchangeably. While the two are similar, there are important differences between dementia and Alzheimer’s. Dementia is a general term used to describe symptoms that affect memory, daily activities and communication abilities. It is often associated with the cognitive decline of aging. Although dementia largely affects older people, it is not a normal part of aging. According to the World Health Organization, 47.5 million people around the world are living with dementia. Alzheimer’s disease is a very specific form – and the most common type – of dementia. It is a progressive disease that affects the parts of the brain that control thought, memory and language, and it is a disease that gets worse with time. Alzheimer’s is responsible for 50 to 70 percent of all cases of dementia. Although symptoms of the two may overlap, understanding the differences between dementia and Alzheimer’s is critical for management and treatment. Dementia is a set of symptoms that affects mental cognitive tasks such as memory and reasoning. It often begins with incidents of forgetfulness and trouble keeping track of time. As dementia progresses, forgetfulness and confusion increase. Obvious signs of dementia include repetitive questioning, poor hygiene and bad decision-making. Dementia is a major cause of disability and dependency among older people worldwide. It can be very difficult not only for the people who have it, but also for their caregivers and families. There are multiple causes of dementia. Some are reversible with treatment, such as those caused by vitamin deficiencies, thyroid problems and metabolic disorders. Others are irreversibly progressive. The outlook for people with dementia depends on the direct cause. For example, vascular dementia, the second most common form, can be slowed down, but still may shorten one’s lifespan. With dementia due to Parkinson’s, treatments are available to make symptoms more manageable, but this degenerative neurologic disease is an irreversible form of dementia. Alzheimer’s is not reversible. It is a degenerative disease, and there is currently no cure available. 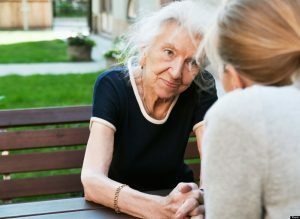 The symptoms of Alzheimer’s include difficulty remembering recent events or conversations, depression, impaired judgment, confusion and disorientation. Symptoms usually develop gradually and get worse over time. They eventually become severe enough to disrupt daily living. Although younger people can and do get Alzheimer’s, the symptoms usually begin after the age of 60. The average person diagnosed with Alzheimer’s has an estimated lifespan of four to eight years after diagnosis, but some people can live with the disease for up to 20 years. It is important to understand the differences between dementia and Alzheimer’s as treatment options vary significantly depending on the underlying cause of the dementia. If your aging loved one is experiencing symptoms of dementia, it’s important that they get medical attention as soon as possible. Your local Alzheimer’s Association Chapter can provide additional resources. If you are an adult child caring for an aging parent suffering from dementia, FirstLight Home Care can help provide care at home to help keep at least their surroundings familiar in a world suddenly filled with uncertainties. Contact us to learn more about our person-first dementia care services. This did NOT make it clear the differences between Alzheimer’s and dementia. Both get worse over time. Both lead to death. Both demonstrate confusion and memory problems. I tried to get a medical diagnosis and treatment for my husband early and two different neurologists didn’t listen or take us seriously. I am now living with a daily nightmare and and loneliness. Our health care system fails miserably. Chriss, thank you for commenting. We are sorry for what you’re going through. We understand how difficult it can be caring for someone with Alzheimer’s or dementia, and how challenging it can be finding the right support. God bless.